Andrzej Jackiewicz is an experienced Executive, successful in building high-performance businesses and teams. Experienced in managing diverse organizations in both turnaround and growth businesses. Visionary but with clear attention to ‘down to earth’ operations and detail. Andrzej Jackiewicz graduated from University of Gdansk, Poland (Major: Management, Finance, Marketing) and Lund University (Sweden), Major: Marketing and Economics. Andrzej spent his first twelve years of the career with Procter&Gamble (Polish and European markets), where he took various roles (both line and in-house) in Sales Department at P&G Poland and abroad (Central&Eastern Europe, Middle East and Africa) including CEE Operations Manager role. He then worked for Tchibo for over eight years initially as Sales&Marketing Director for Poland, Baltic States and then General Manager Hungary both for FMCG and retail sectors. 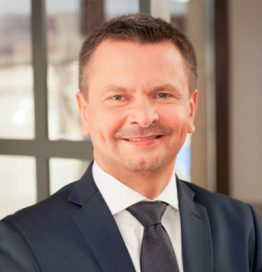 In April 2013 Andrzej became a Managing Director for Costa Coffee Poland&Latvia, based in Warsaw, Poland, leading a team of over 1200 employees. Since joining Costa, Andrzej has had a huge impact on Costa business; rebranding the Polish business from Coffeeheaven to Costa Coffee, followed by the creation and execution of the strategic agenda for Poland, all whilst building a very strong team at the same time. In September 2016 Andrzej took up the post as Managing Director Europe also joining the Costa Executive Board. Andrzej is married, with two children. He loves spending his free time with his family and friends. He enjoys skiing and jogging and is a keen sports fan as well.